This post contains affiliate links, which means if you click on any of the product links I will receive a referral fee. As some of you may know, I’ve been in partnership with World Nomads for some time now. And as part of my efforts in bringing awareness to travellers about travel insurance, I love bringing news of opportunities for people to travel and even learn and develop skills anyway possible. 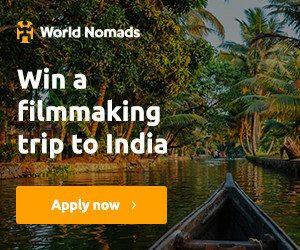 World Nomads had recently announced that they will be giving out a scholarship for any aspiring filmmaker for a 12 day all expense trip to capture the stories of the communities living in Kerala, India. What’s even better is that filmmakers will work together alongside professional filmmaker, Brian Rapsey who is also one of the panel judges for this year’s scholarship. It has been a ten-year effort by World Nomads in providing budding or up and coming filmmakers with an invaluable mentorship from industry professionals. These experiences are usually tailored to deliver actual in-field filmmaking experiences, from sound knowledge of camera, audio, capturing a narrative, interviewing, direction and post-production. This year, World Nomads partnered with Nomad Goods and a local tour operator, Kabani Tours in order to provide essentially an awesome filmmaking travelling experience complete with complimentary travel accessories and personalised tour of the region. Free Flights – A round-trip airfare from your closest international airport to Thiruvananthapuram in Kerala, India. 12-Day filmmaking Trip – This is your chance to learn from the best mentor in the industry, Brian Rapsey. Post-Production Workshop – Included in the trip is a 3-day workshop where you’ll learn how to edit the documentary and continue learning anything there is to know about documentary production from Brian Rapsey. Audio Gear – Use the new Video Mic Pro to record superior sounds for your film and use VideoMic Me™ iPhone directional mic courtesy of Rode Microphones. Nomad Accessories – You’ll get to equip yourself with some seriously cool and minimalist smartphone and smartwatch accessories from Nomad. Travel Insurance – So..while you enjoy your filmmaking adventures in India, World Nomad’s got you covered. So here’s the deal. You need to show the judges that you truly enjoy creating adventure stories and have the passion for travel filmmaking. A good travel documentary should always include strong narrative English (don’t worry your film can include English subtitles) and focus on a specific story, which you need to achieve within a 3-minute timeframe. When you apply you need to ensure that you can show them your awesome interviewing skills and that you can get a good story out of your subjects. Lastly, show them you’ve got strong filmmaking skills, be original and that you’re visually engaging. Applications close on July 18th, 2017. Good Luck! If you’re up for it…..apply now!